While we wait to see what Mom and Dad Decorah are going to do, I thought I'd write a blog to celebrate owls. I collected this information from a number of sources, but I especially want to acknowledge the Owl Pages for their help. Owl Pages also has a facebook page. See the bottom of the page for all of my sources. Talons and a 'hawk-like' beak. Owls have a number of adaptations that help them survive and thrive after dark, including highly specialized hearing, vision, and plumage. Although owls are renowned for their ability to see at night, their highly specialized hearing plays a crucial part in helping them catch prey in low light and under heavy snow cover. degree of accuracy. See bottom of page for image credit. Ear tufts are not ears. An owl's ears are located on the sides of its head, under the feathers of its facial disk. The owl's facial disk, which splits into left and right sides down the middle of its face, acts as a sort of parabolic microphone, funneling sound into the ear on 'its' side of the owl's head. In addition to magnifying sound, an owl's facial disk helps provide directional hearing. An owl can move its facial disk feathers to change the disk's shape, guiding more sound into one ear than the other. Some owls can establish left/right prey directionality based on differences in sound wave arrival times just 30 millionths of a second apart. Directional hearing doesn't end with the owl's facial disk. Many owls have asymmetrically set ear holes - that is, one ear opening is higher than the other - which helps them determine the vertical location of their prey. 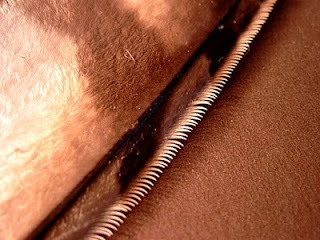 In this case, sound waves arrive in either the upper or lower ear first, establishing the prey's vertical location. The combination of x and y-axis locations are believed to create a three-dimensional mental image of the space where the sound source is located, enabling the owl to strike even hidden prey with a high degree of accuracy. An owl perched in a bare oak tree hears a mouse rustling under snow in a wintry nighttime forest. The sound reaches her right ear slightly faster than her left ear, so she knows which direction the rustling is coming from. She turns her head until the sound reaches both of her ears at the same time, signaling that the mouse is right in front of her. Now she knows the general location of her prey, but she needs to pinpoint its location more accurately in the darkness. Sound reaches the owl's lower ear hole first, which tells her that the mouse is below her line of sight. She dips her head until she hears the sound equally in both ears. Her prey is deep in the snow. She launches into the air, flying silently thanks to her highly specialized feathers. See bottom of page for full attribution. 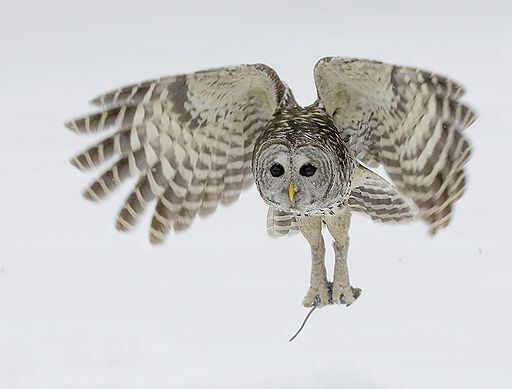 Owls have four sharp, curved talons specialized for sensing, catching, and killing prey. In addition to special filoplume feathers that help some species of owls sense when they've made contact - a useful adaptation for hunting in the dark - the underside of an owl's foot is covered in a rough, frictional surface that helps owls grasp and hold prey. Many owls live in cold weather, and feathered or 'booted' feet also protect them against the cold and bites or scratches from their prey. Like many birds of prey, an owl's feet appear massive in comparison with the rest of its body. When perching, two talons are directed forward and two behind. A flexible joint allows three talons to swivel forward during flight. When striking, owls spread their talons wide in a rough oval shape, increasing their chance of success. Once they've made contact with prey, owls knead and crush it with their large, powerful feet, using their sharp, hooked beaks to grip and tear tissue. About two feet from her target, she brings her feet forward, spreads her talons, and strikes. Success! The mouse can't escape her rough feet and sharp, curving talons. She quickly dispatches it, crushing it and wolfing it down head first. The Owl Pages. Check them out - it's a great site! Like many nocturnal animals, owls have tubular eyes and an abundance of rod cells, which are excellent at collecting light but don't see color well. Consequently, owls have monochromatic vision and cannot roll or move their eyes within their sockets, but must swivel their heads to visualize their surroundings. The swiveling radius of the owl’s head is around 270°, so it can see behind itself without turning around. However, owls don't see well in the dark just because their large eyes are good at gathering light. Their fixed tubular eyes give them a long axial eye length - that is, there is an unusually long distance between the cornea and the retina, called the Posterial Nodal Distance or PND. The longer the axial length of the eye and PND, the larger the image projected onto the retina. The owl's larger retina also has room for a lot of photoreceptors, giving it heightened visual acuity since each photoreceptor processes a smaller portion of the image. In short, an owl's long, tubular eye projects a large image over a large, dense field of photoreceptors, enabling it to see detail and depth even in very low light conditions. of page for full attribution. When birds fly, air rushes over their wings, creating lift and turbulence. The stiff edge of a normal bird's wing produces a larger area of turbulence, which makes a whooshing noise. However, the comb-like soft edge of an owl's wing breaks down the turbulence and muffles the sound of air rushing over the wing surface. The lack of owl-related flight noise helps owls hear prey while keeping prey from hearing their approach. The plumage of owls is generally cryptic - that is, the colors and patterns of their feathers camouflage them. 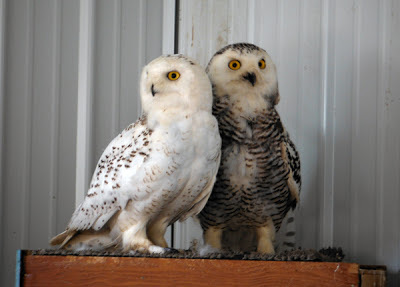 For example, Snowy Owls live in the tundra and are primarily white, while Great Horned Owls live in the woods and are brown, grey, and white. Changes in cryptic patterns can even be seen within species inhabiting different ranges: Great Horned Owls that live in birch forests tend to be a little lighter than those that live in darker oak or maple forests. Eggs should begin to appear in our nests in the next week or three. The earliest date they've appeared at Valmont is February 8th (in 2008) and the latest is February 25th (2007). We hope you enjoy watching them! Owl vision: http://www.owlpages.com/articles.php?section=Owl+Physiology&title=Vision (check this site if you like owls. They also have a facebook page. Just like the other 13 snowy owls that SOAR worked with in 2012, SNOW1 came in starving. Seven of the 14 owls died before they got to SOAR’s facility. Five more died despite our best efforts at rehydrating, warming, and trying to reverse their severe starvation. Most had lost half their body weight. Two owls made it through. One of these had a dislocated elbow and cannot fly. He is now an ambassador for his kind as a SOAR education bird. One female, SNOW1, made it to release. This is her story. SNOW1 was rescued from a farm field by Wright County Conservation Board staff in January 2012 and conservation board volunteers, the Rector family, drove her down to SOAR. She weighed 2.5 pounds. Female snowy owls should weigh between 4 and 4.5 pounds. She was kept warm (we do not want starving birds to have to spend any of their precious energy trying to keep warm), tube fed high calorie fluids, and slowly force fed easily digestible solid food. She was able to bounce back and started eating on her own! After a month in intensive care she was moved to a medium-sized flight pen to stretch her wings. As you can imagine, she was fairly weak and it took another good six weeks for her to get her muscles back into shape. At this point the snowy migration was over and with a few feather imperfections we decided to intermew (let her molt) here at SOAR. Then several folks worked on a plan to be able to monitor her after release. SNOW1 gets flight practice with her transmitter on. Bob Anderson, Raptor Resource Project, and Brett Mandernack, Eagle Valley Nature Preserve, stepped up to provide a transmitter and the expertise to gather and monitor the location data. SNOW1 made a quick trip to Decorah to have the transmitter attached with a backpack type of harness. She spent more time in SOAR’s 100-foot flight area to develop muscle and make sure the transmitter was comfortable and not interfering with any of her activities. She also had live prey practice and made easy work of this, when other food wasn’t provided. We needed to decide when and where to release her. We consulted several experienced rehabilitators and thought that taking her further north and waiting for fall, when other snowys would be moving back in would be a good plan. Minnesota DNR agreed to allow transport to their state for release. As we were preparing to do this, snowy owls began arriving in Iowa. A look at habitat areas in western Iowa showed several large wetland and grassland areas that should hold good numbers of small mammal prey items. SNOW1 was banded, thanks to the Iowa Department of Natural Resources (Iowa DNR), and ready for release. Matt Wetrich with Carroll County Conservation Board and Paul Roisen with Iowa Ornithologist Union released her at Woodbury County Conservation Board’s Owego Wetlands. She flew beautifully and was back in the wild. It was very exciting to get the first data locations to find that she had moved several miles north, then back south, in all traveling over 30 miles to finally spend a week in and around Onawa, IA. Before she left the Woodbury County area, Paul Roisen was able to locate SNOW1 and get a wonderful photo. She was perched on a power pole and looking in command of the situation after about a week in the wild. Then a report came from the Iowa Ornithologists Union birdline of a Snowy along Interstate 29 near Onawa. Fearing she had been hit by a car, Wildlife Lodge and Clinic volunteers were dispatched from Sioux City to try to find her and bring her in. Even with a good visual report and our transmitter data, they could not find her. An Iowa Department of Transportation staff person joined in the search and reported picking up a dead, unbanded snowy owl just a few miles north of Onawa on Interstate 29 a day or two earlier. This was not good news. Snowys were choosing to use the area, but were not fairing well. Iowa DNR biologist, Doug Chafa, stationed near Onawa, joined in the search and got a visual on her spending time in the cloverleaf interchange between Interstate 29 and Iowa Highway 175! Not the spot I would have chosen for her, but she was flying, perching and preening. She was on her own. We had several more transmitter locations for her around the Onawa area, which seemed to be good small mammal habitat; old hayfields, mowed filter strips, and stream buffers. Then after three weeks in the wild, no movement was detected from her transmitter and we feared the worst. As it would happen, Helen Harvey, a falconer from Sioux City, was en-route near Onawa. She made a thorough walking search of the area of SNOW1’s last signal with no luck. SNOW1 must be out of sight somewhere. Dean, Ray, and Warren from the Siouxland Metal Detecting and Archeology Club volunteered an afternoon with their equipment for a high-tech search with Helen. They found her thin body under the snow. She had not survived well in Iowa. Necropsy (animal autopsy) confirmed that she was not shot, did not have any broken bones, no aspergillosis, her stomach was empty and she had no body fat. As with most good research, this has answered one question and brought many others to mind. Could we have done something differently? Somehow better prepared her to survive in the wild? Chosen a different release location or a different time of year? As with all of our wild patients we did the very best we could with SNOW1 for her to have a good second chance at being wild. From band return data we know that many of our released birds survive well. A red-tailed hawk was recovered eight years after release, just seven miles from her release site. An arctic-phase great horned owl that was released in Carroll County in December was recovered more than six months later in Northern North Dakota. A bald eagle was picked up in Mills County with a fractured humerus that was repaired and released in Carroll County. This eagle was found three years after release, she had flown over 100 miles back to Mills County. Is the landscape (habitat) in Iowa so different from the tundra that snowy owls cannot figure out how to catch prey that is different from the normal diet of lemmings and arctic voles? If the snowy owls were released in March, closer to the time they should be returning north, and released near the Canadian border, would they have better survival? Perhaps the snowy owls that come this far south are not good candidates to contribute to the wild population and should not be released? The technology to track birds after release is amazing. 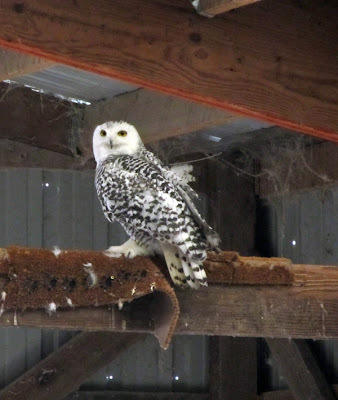 Even though we all wanted SNOW1 to have a successful winter and migrate back to the arctic to nest, her information will be invaluable to help with future snowy owl rehabilitation. Snowy owls are a very interesting species and may be impacted by climate change. Knowledge about their movements and survival could be an important indicator of what may be happening in the arctic. Stay tuned, we may make plans for SNOW2. I am always amazed at how many people are willing to help wildlife in distress; it warms my heart and helps me to keep going even when things don’t work out as we would have hoped. 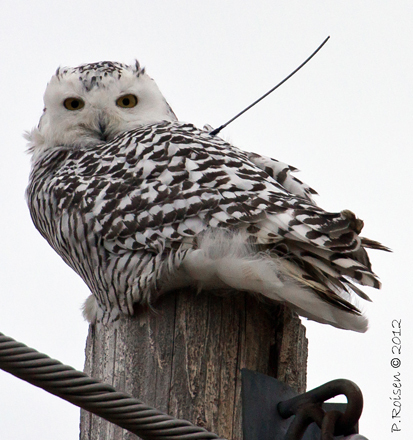 A big thank you to everyone who helped with SNOW1’s rescue, recovery, release, and monitoring! She definitely left an impact on many people. Mom and Dad at the tree. They do seem to have been making more visits to the Y-branch and environs lately. Mom and Dad visiting the original nest. Mom and Dad working on the original nest. We're especially watching for soft nesting materials such as grass and cornstalks. The winter of 2011 was more comparable to this winter: colder and snowier! Again, the eagles brought in sticks fairly early on, but soft nesting materials really didn't begin to appear until January 21st, as these two videos show.